My friend Karol agreed to come to my impromptu Chinese New Year‘s Eve dinner last night only on the condition that there would be no utterance of the words “rat” or “mouse,” so just getting it out of my system. Ringing in the Year of the Rat is understandably awkward when trodding the sodden confetti and firecracker papered streets of a New Year’s aftermath-stricken Mott St., kicking the occasional half-eaten bun. I’m not sure the ancient Chinese had counted on the uneasy relationship today between rats and food when they honored the animal with a year in their twelve-year calendar. Maybe they were much more docile creatures back then, a companion almost. Or maybe they had a sense of humor about them, like the makers of Ratatouille. Whatever the case, we’re stuck with the critters, be they infesting our holidays or apartments. I made it to Chinatown before the proper festivals got underway to grab some essentials for basic homemade dumplings, not-so-homemade turnip cake, veggies and desserts for a modest feast. 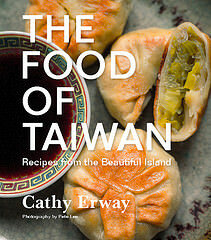 When my gals/guests arrived, they were greeted only with some pan-fried turnip cake, a bowl of raw pork, shrimp and chive dumpling filling, a stack of round dumpling wrappers and beer; they were in for a little chore. Come to think of it, “dumpling” isn’t the most appetizing word either. I’ll just refer to them in Chinese as jiao-zi then. I’m not a purist when it comes to folding jiao-zi any certain way; the only imperative is that the final product has a wide, flat bottom surface that it can stand upright on. When pan-fried, this becomes golden and crispy — everyone’s favorite part. I once watched an episode of Good Eats where Alton Brown completely missed this point, and his unshapely “dumplings” settled on their convex sides. (As it turned out, I managed to lose some of the best parts to the bottom of the pan because I wasn’t paying enough attention to their cooking. Those browned bits of noodle that I scraped up, though, were definitely the highlight of my meal.) The other important thing about folding dumplings is that it’s a social activity, an experience meant to be shared with friends and family. 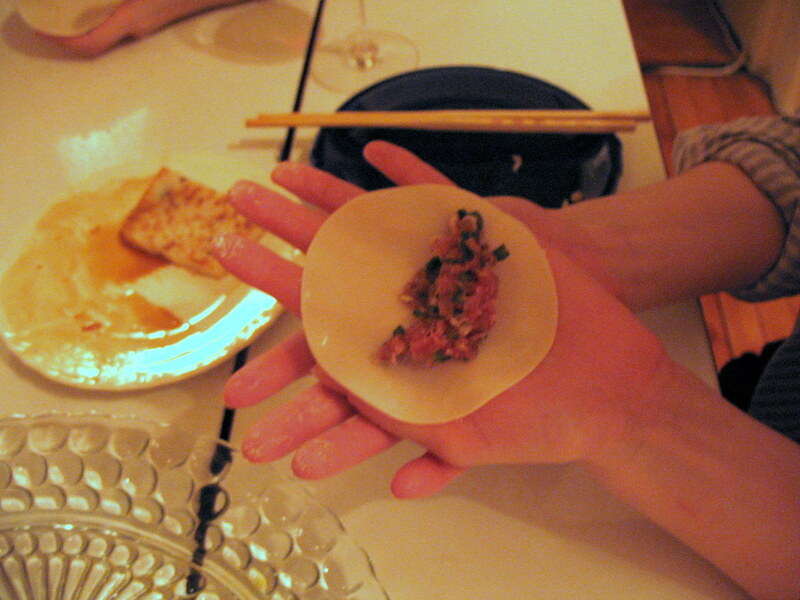 There were many a styles of wrapping dumplings even between the three of us. Karol specializes in what I shall refer to as the “pinch-pinch-pinch” method, which produces a lovely pleated ridge along the dumpling, sort of like ruching on a dress. I practiced a more plebian double triangle-type fold, while Erin experimented with a few folds of her own. When the first tray was filled with our creations, I got them started on the pan; by the time every last spoonful of filling was tucked into a fresh dumpling, dinner was ready. Though the dumplings may have been homemade, in the case of the turnip cake, another traditional New Year’s Eve delicacy, I simply purchased a block of turnip cake in a shrink-wrapped package from Chinatown and sliced it up. 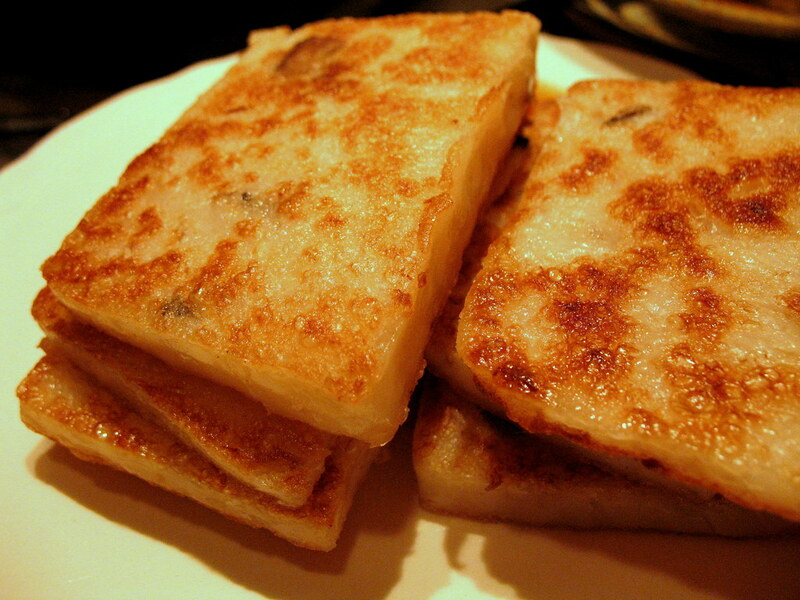 Making turnip cake at home is a rather complicated process that I haven’t yet mustered the courage for — but after discovering this truly unparalelled step-by-step account, I may just have to give it a shot sometime. how’d they get so long? 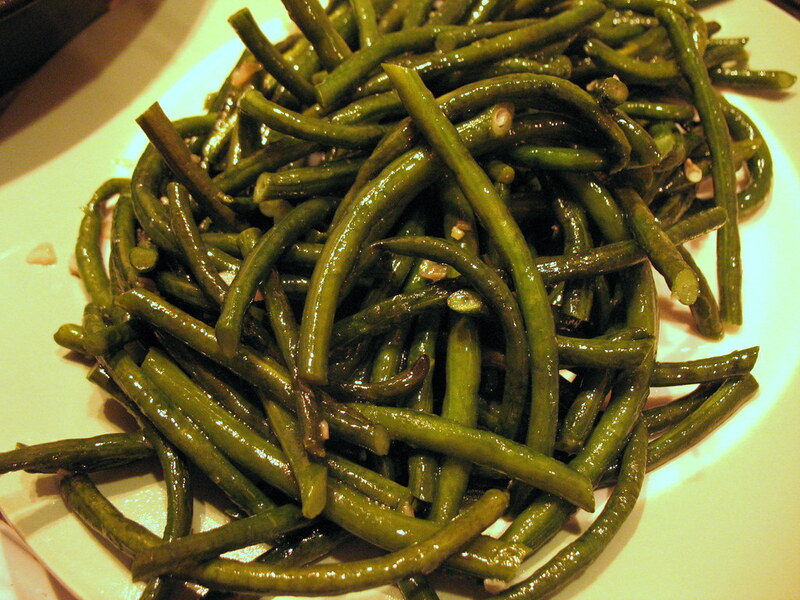 To go with these salty snacks I stir-fried some long beans with garlic. The Chinese have a superstition of eating long things in order to ensure a long life – that includes noodles, long beans, Twizzlers Cherry Pull ‘n Peel licorice threads – anything relatively long. While a long life is good and well, this year I’m eating long beans especially in the hopes of being at my next apartment for a long time. Or at least longer than the 14 months I’ve been in my current apartment, which is incidentally the longest I’ve spent at any one residence ever since moving out of my parents’ house for college. Today, I submitted my application for a new apartment which I will hopefully be calling home by the end of the month. (I’ll tell you where it is then.) As for long-term relationships? I’m less concerned about eating to that right now. Oh — and we did break out the chocolately mess that I made last Sunday for a less traditional dessert. I can think of few better ways to kick off a new year, and a new outlook, than making dumplings with good friends. New Year’s Eve or not, I highly suggest you try it sometime, too. Buy some ground meats, tofu, veggies of any kind, chop ’em up real small, and make mounds of goodness to eat and share, or keep in the freezer for a rainy day. The filling I made last night is a simple, classic combination of pork and shrimp. I’ve gotten to preferring Chinese chives to scallions recently, which my uncle introduced me to. With a delicate, silky texture and deep green color, they’re less sharp-tasting, which brings out the flavor of the shrimp. You can find them in bunches in most Asian groceries; as an alternative, you could also use finely shredded leeks. Note that the recipe below is for the pan-fried version of jiao-zi, or “potstickers” (because they stick to the bottom of the pan). 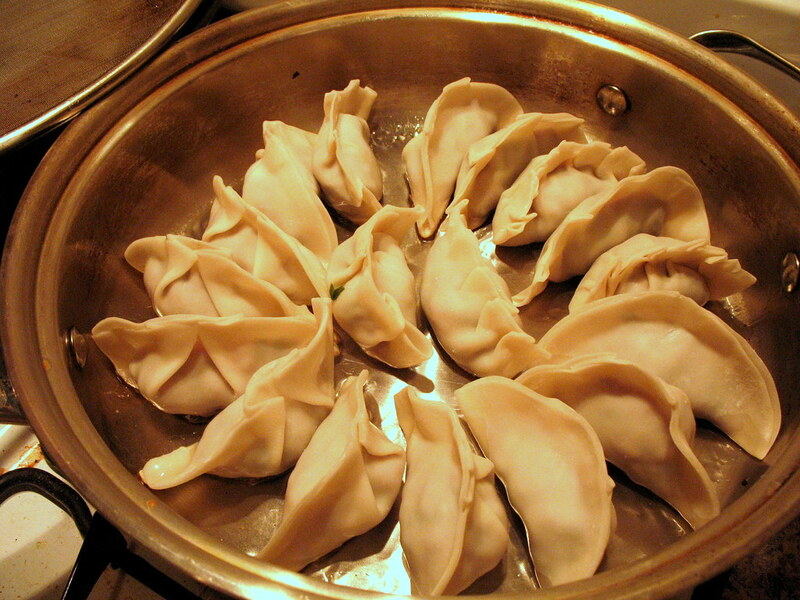 The same filling can be used to make boiled or steamed jiao-zi if you prefer. I’ve tried to describe the folding method I find the easiest to use. You can visit many other sites for instruction on other methods, a video demo, or just a better explanation of it all. To make the filling, combine all the ingredients except for the dumpling wrappers and the oil in a bowl. Gently mix with a spoon or chopsticks to evenly distribute the ingredients. It’s best to sprinkle the soy sauce and cornstarch into the mixture a small bit at the time, in between mixing. Cover and refrigerate for at least one hour, or up to overnight. Seven brownie points: We all know that ground pork and shrimp are not the most cholesterol-reducing foods. But a little bit of them goes a long way in terms of flavor. Chinese chives give these dumplings a fair share of characteristic leafy-greens nutrients like Vitamin A, Vitamin C, folic acid and potassium. 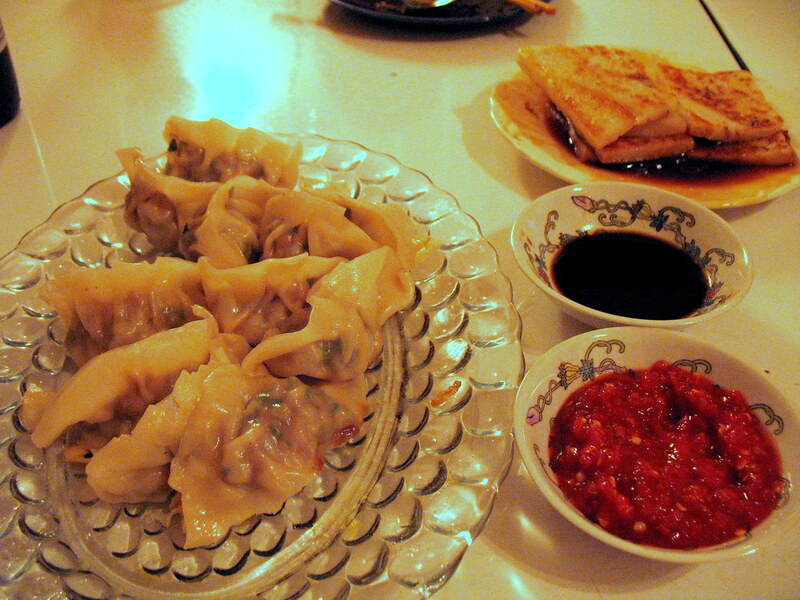 When served with more vegetables on the side, dumplings make a fairly healthy, balanced meal. Looks like a fun time! And the dumplings look tasty. 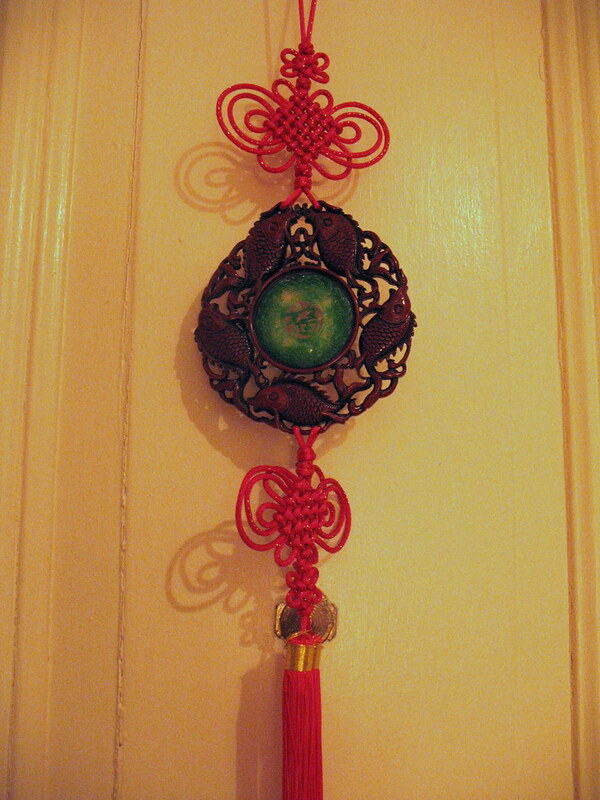 A very happy year of the rat indeed with dumplings like this! Dumplings are such a good dish to make for parties. I had a few friends come over once and we all “stuffed” them. Hmmm, makes me want to make a few right now! 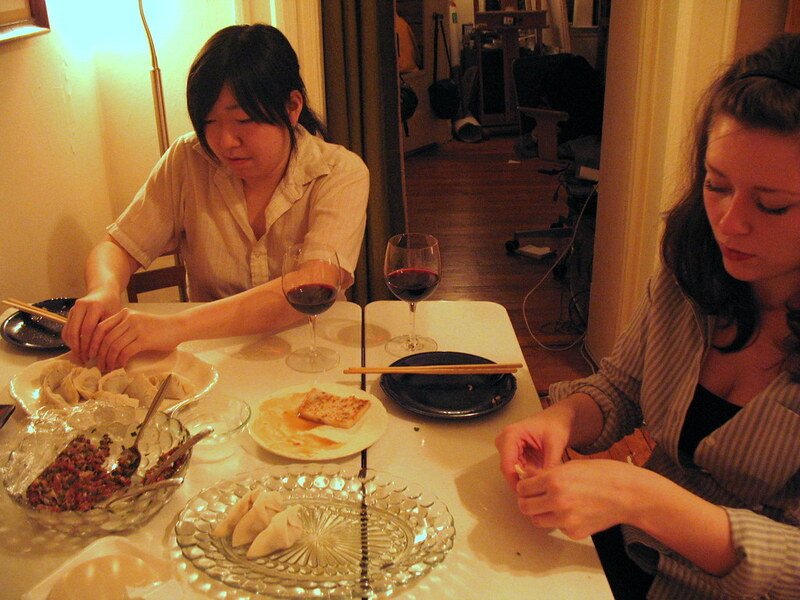 Dumpling parties are definitely a good way to combine food, fun and friends… sometimes family too! jiao zi, are dumplings. They’re steamed or boiled. I apologize if this sound brusque, but I thought I should clarify. encourage your followers to share your content….